“The world needs places that equip individuals to serve with compassion, acknowledging our differences while valuing our one-ness.” —Center for Action and Contemplation. If you polled 100 people walking down any given street in America and asked them if there is something they want to see changed in our world, my guess is every one of them would have a decent list of items, institutions or situations they would like to see changed. We live in a world where horror and deprivation are in every community. In some communities its easier to see, the tragedies that plague many parts of our world are highly visible yet many of the horror stories that unfold are hidden behind white picket fences and manicured lawns—these stories seep into our consciousness more slowly but the shock when they’re uncovered is just as real as the shock of the more visible injustices we see blasted on our news feeds 24 hours a day. Sometimes the magnitude of injustice and scarcity is so insurmountable we get frozen with grief and unbelief, apathy sets in and is easily accepted. It’s easier to turn the channel or click on a funny video clip than to stretch our minds around what we can do to make a difference. The thing is we all have the opportunity to make changes in our world. We at the Butterfly Effect are privileged to witness the enormous ripple effect that small acts of service and selflessness can produce, changing lives, institutions and situations for the better. 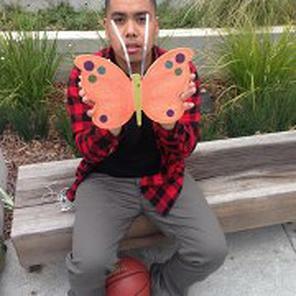 Mike released the butterfly in Boedekker Park in the Tenderloin, a location that was recently reopened after a $9.3 million renovation. The park that had been a haven for drug dealing and open use, is now home to several youth serving nonprofits that run after school programs, play grounds, basketball courts community organizations and businesses. Zaldy Tubig is a 26 year old artist and musician who grew up in the Tenderloin neighborhood. 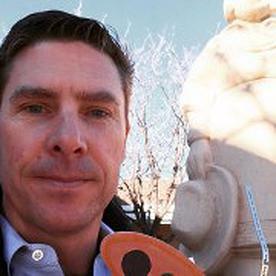 As he walked by a park bench on his way to volunteering for an after school program in Boedekker Park, he noticed the butterfly out the of corner of his eye. “I thought it was somebody’s art project that was forgotten.” Upon closer look he discovered the instructions on the back and “decided to give it a try.” As I spoke with Zaldy about his experience with the Butterfly Effect, it seemed as though these types of experiences and opportunities were more tales of folklore that ruminated in his community rather than ideas with flesh and a part of a personal narrative. Sirens blared in the background on and off during our 20 minute phone conversation, illuminating the reality of Zaldy’s urban environment, but just as loud was his excitement for being able to help give back to an organization that has given him so much. I could hear the smile on his face and pride in his heart as a result of being a part of giving back to his community that had given so much to him. Music, Mural and Arts Program (MMAP) is an organization dedicated to connecting “disadvantaged youth with consistent, encouraging mentors and role models through arts programs emphasizing community development, academic achievement, and their own positive futures.” In 2014 MMAP hosted 12 programs that served 485 students, created 15 murals and 24 original songs, created and curated a permanent art exhibit at San Francisco’s Hall of Justice, and installed over 400 feet of public art in East Palo Alto Parks. MMAP has been an integral part of Zaldy’s ability to produce original art and music that reflects his reality in a positive way. Being able to financially give back to MMAP and receiving the confirmation of funds donated in his name has definitely impacted how he sees his future, solidifying his desire for his career to be connected to giving back to his community. For now Zaldy is focused on school, the summer mural project and his song being dropped on Spotify in the next few weeks- that has all been made possible through MMAP. Thank you Mike and Zaldy for Being the Change!